Bimanual manipulation of objects is receiving a lot of attention nowadays, but there is few literature addressing the design of the arms configuration. In this paper, we propose a way to analyze the relative positioning of two redundant arms, both equipped with spherical wrists, in order to obtain the best common workspace for grasping purposes. Considering the geometry of a robot with a spherical wrist, the Cartesian workspace can be discretized, with an easy representation of the feasible end-effector orientations at each point using bounding cones. After having characterized the workspace for one robot arm, we can evaluate how good each of the discretized poses relate with an identical arm in another position with a quality function that considers orientations. In the end, we obtain a quality value for each relative position of two arms, and we perform an optimization using genetic algorithms to obtain the best workspace for a cooperative task. 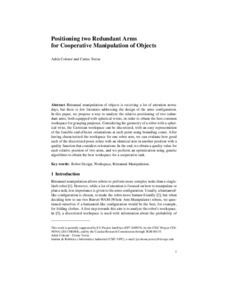 Colomé, A.; Torras, C. Positioning two redundant arms for cooperative manipulation of objects. A: International Workshop on Computational Kinematics. "Proceedings of the 6th International Workshop on Computational Kinematics (CK2013)". Barcelona: Springer, 2013, p. 121-129.